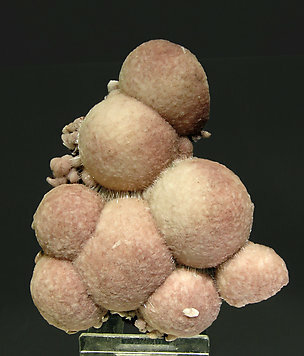 The piece shows spheroidal growths formed by radial crystals of Thomsonite that can be seen on its edges. We must especially emphasize the reddish color, very uncommon, due to the presence of iron oxides. The specimen has been reviewed, photographed and published as a new discovery in the magazine ‘‘Mineral Up’’ on page 25 in number 2006/2. 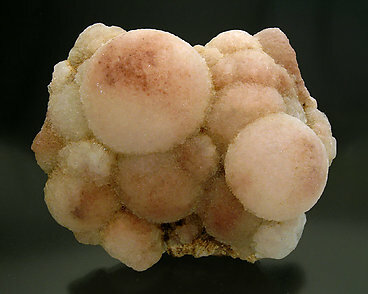 Well defined Thompsonite spheroidal growths, pinkish color, with crown growths of small acicular and bright Scolecite crystals. Very pleasant and esthetic specimen on matrix.